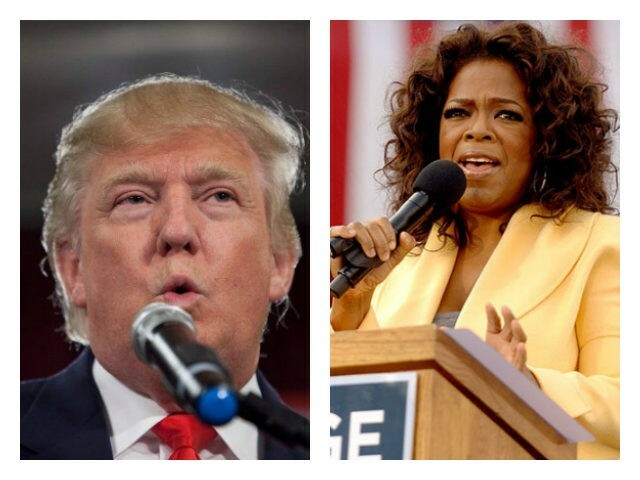 President Donald Trump taunted Oprah Winfrey on Sunday night via Twitter, egging the nationally known talk show host on in an effort to get her to run against him for president in 2020. Just watched a very insecure Oprah Winfrey, who at one point I knew very well, interview a panel of people on 60 Minutes. The questions were biased and slanted, the facts incorrect. Hope Oprah runs so she can be exposed and defeated just like all of the others! Winfrey on Sunday evening’s 60 Minutes hosted a panel of 14 Michigan voters, the second time she has hosted this gathering, to get their thoughts on the election in 2016 and what has happened since then. Michigan is a state in which Trump shocked Democrat Hillary Rodham Clinton, beating her for the first time a Republican has won the Rust Belt state in decades. Trump also won Pennsylvania, Ohio, and Wisconsin, key Rust Belt states on his pathway to 306 electoral votes and a victory. He came within a few thousand votes of victory in other battleground states like Minnesota, New Hampshire, Nevada, and more—again shocking the political world. Winfrey’s panel on Sunday night focused mostly on things like Trump’s temperament for office, the president’s reportedly vulgar language regarding a variety of things, including “shithole countries,” Trump’s Twitter, his ego, and the so-called #MeToo movement, rather than issues—though the Trump supporters in the room brought up the economic successes of the Trump administration. There has been an enormous amount of discussion about whether Winfrey may run for president in 2020, though people close to her have said she is not considering it. Winfrey appeared at the Golden Globes, where she delivered a powerful speech that fueled the speculation about the potential 2020 presidential run. Some polling has shown Winfrey ahead of Trump in a 2020 matchup.